The video games sector now accounts for more than half of the UK's entire entertainment market, according to a new report. The industry is worth £3.86bn ($4.85bn) - more than double its value in 2007 - said the Entertainment Retailers Association (ERA). That makes it more lucrative than video and music combined. The success is largely down to three games: Fifa 19, Red Dead Redemption 2 and Call of Duty: Black Ops 4. The games market has grown, despite the fact that the physical console and PC games market shrank slightly in 2018, and digital also had a modest 12.5% growth. Chief executive of ERA, Kim Bayley said: "The games industry has been incredibly effective in taking advantage of the potential of digital technology to offer new and compelling forms of entertainment. Despite being the youngest of our three sectors, it is now by far the biggest." 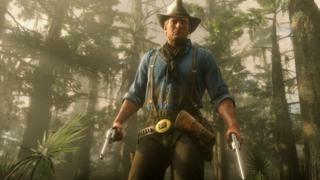 Three games - Fifa 19, Red Dead Redemption 2 and Call of Duty: Black Ops 4 - each sold more than one million physical units in the UK during 2018. The figures do not take account of the success of mobile and free games such as Fortnite, which has more than 200 million players around the world. Piers Harding-Rolls, head of games research at IHS Markit said: "During the last five years the games sector has benefited hugely from the mainstream adoption of games apps on smart devices, and the transition from physical distribution to digital distribution in established parts of the market such as console gaming. "Games are now truly mass market and a very important part of the entertainment sector." He added: "Growth has been fuelled by the dominance of free content and in-game monetisation, which expands the adoption of games but also removes the cap on spending for those gamers that are really engaged in the experiences. "The flexibility of interactive content means it is unique in that it can be monetised in this way, which is an advantage over other forms of entertainment."